Wrote this long thing about my 9/11/2001 but I’m not in the mood yet to post it. Maybe next year? That’s all I’ll say on the topic to spare you the 9/11 overload. Been prepping for another lecture; this one I’m giving downtown in front of a lotta US attorneys tomorrow. Should really post somea the videos when I’m done but then I figured it’d just put you to sleep. HG and I went on two dates recently, both at nice local taverns – PJ Clarke’s and PD O’Hurley’s. No particular reason, the weather’s just cooled down enough so that going outside is bearable. Reminded us of when we were still dating. New York City’s a bit wasted on us since we’re so blase to it. Trying to fight that. Dunno if I ever told you, but I don’t cook in the summertime. Almost not at all. Too hot. 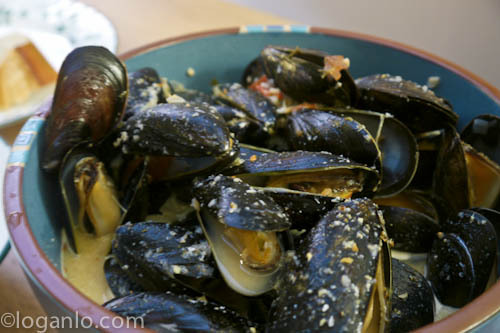 But the weather’s cooled down lots so I made some mussels in a white wine reduction – was trying to recreate a dish we both had and enjoyed on onea our dates. It was good, not great. Too much alcohol left in the pot gave it a bit too much sting in the backa the throat. Did reduce down the sauce after we had all of the mussels the next day; poured it on some angel hair pasta and it was killer. Will have to make more soon. For now, though, gotta make a Powerpoint presentation. Not nearly as much fun. Ugh, I went crazy on my 9/11 post as well and I don't even live in NY. I kept mine as short as possible. Kinda hard since there's still so much to say even after 10 years. And what is it with guys and overloading on the alcohol? My half-Swiss cousin overloaded his fondue with white wine and that's all I could taste. Then there's this noodle soup I tried at this one Japanese restaurant that tasted like nothing but sake. Maybe it's an Asian thing? Where's your blog again? I switched over to a new Mac Air and didn't copy over my bookmarks; I'll also put you in my blogroll. Yes, I'm glad it's over; there's this thick air of sadness and anxiety around that time. As for the mussels, I followed a recipe! I just think I should have let it reduce more before I added them. Still, it was good, not great. I'll have to try again soon. Wander back in here again!